On the fateful night of August 28th, 1856, the Isaac Allerton was caught in a hurricane off Saddlebunch Key, fifteen miles from Key West. 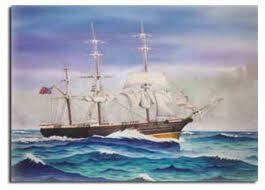 The ship was built in 1838 in Portsmouth, New Hampshire and was 137 feet long weighing 594 tons! Despite her strength, her lines were eventually cut and she ground over Washer Woman Shoals, sinking in Hawks Channel in five fathoms of water. Luckily, Isaac Allerton lives on in the Key West Shipwreck Treasures Museum where you can see the original cargo! Even Ships Like These Wrecked!